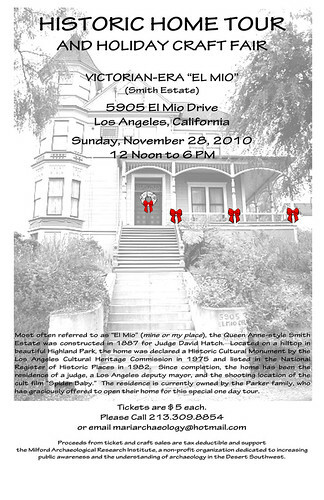 Big Orange Landmarks: Your Chance to Tour "El Mio"
Your Chance to Tour "El Mio"
"The LA city Cultural Monument Victorian residence of El Mio will be open for a Home tour and craft fair November 28, 2010. El Mio is perched on a hilltop overlooking historic Highland Park. 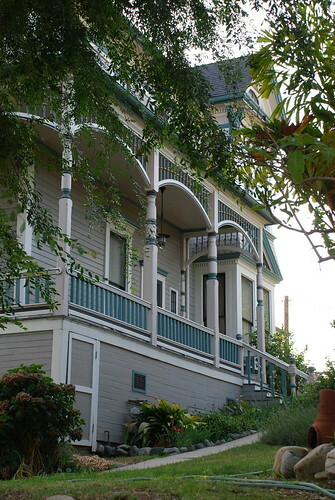 Completed in 1887, the home was built in the Eastlake Queen Anne-style by the occults writer Judge David Patterson Hatch. In 1890 the residence was acquired by Charles William Smith and remained in the Smith family until the 1960s. In 1900 Smith was appointed by Henry E. Huntington to run the Los Angeles Railway’s Yellow Car trolley system. From his hilltop home he could see the Arroyo Seco Valley being developed with rail lines running from downtown to Pasadena. It is due to the Smith's long residence that the house is listed as "The Smith Estate" on the National Register of Historic Places. restore the home to its original luster. It has a rebuilt attic, the exterior color scheme is based on the original, and the interior has been largely decorated to reflect the original period. The home has Victorian furnishings and hand painted stenciling in the entrance hall, dining room, and many of the other rooms. The Parkers have graciously offered to open their home for a tour and craft fair. Tickets are available for the home tour by calling 213 309 8854 or via email at mariarchaeology@hotmail.com. Proceeds from ticket and craft sales are tax deductible and support the Milford Archaeological Research Institute, a non-profit organization dedicated to increasing public awareness and the understanding of archaeology in the Desert Southwest." Stopped by on a whim. Glad to see you're backing posting. I'm delighted to see you back, Floyd. If you have found the task of documenting all the Landmarks daunting, have you considered assigning projects out to willing readers? I know I'd be happy to contribute a post or two. I second that - both the delight in seeing your recent posting, and the offer to take on an occasional building as a research project to share the load. Your blog is such an awesome resource. Whenever I visit a new building I am always bummed if it hasn't yet been covered by you because your posts are quite insightful. I toured the inside of the Los Almost apartments on this weekend's Great LA Walk and thought of you.